Cajun is a favorite flavor with a yummy bite to it. It’s delicious with any fish actually. Did you know it also makes a great pasta sauce? The sauce included here will make you smile if you enjoy spicy food. 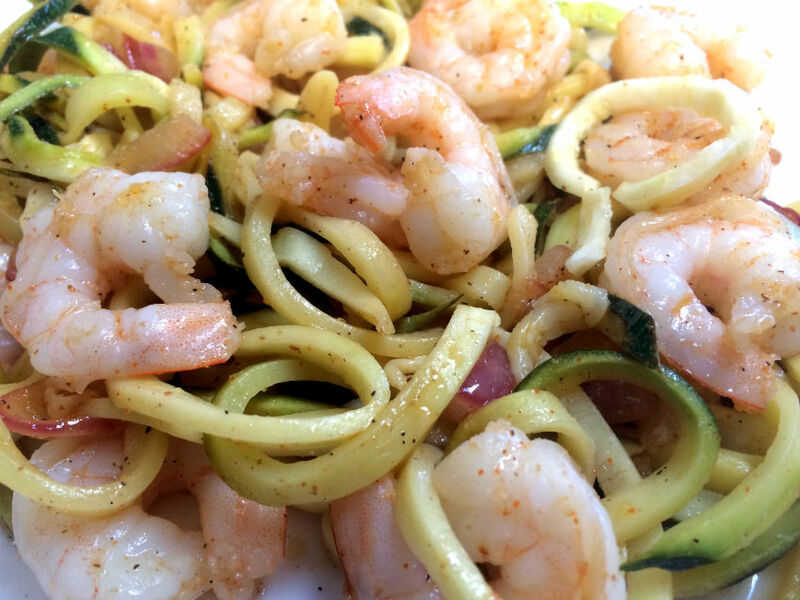 The lemon juice and the creole seasoning in the olive oil are wonderful with our healthy zucchini pasta. 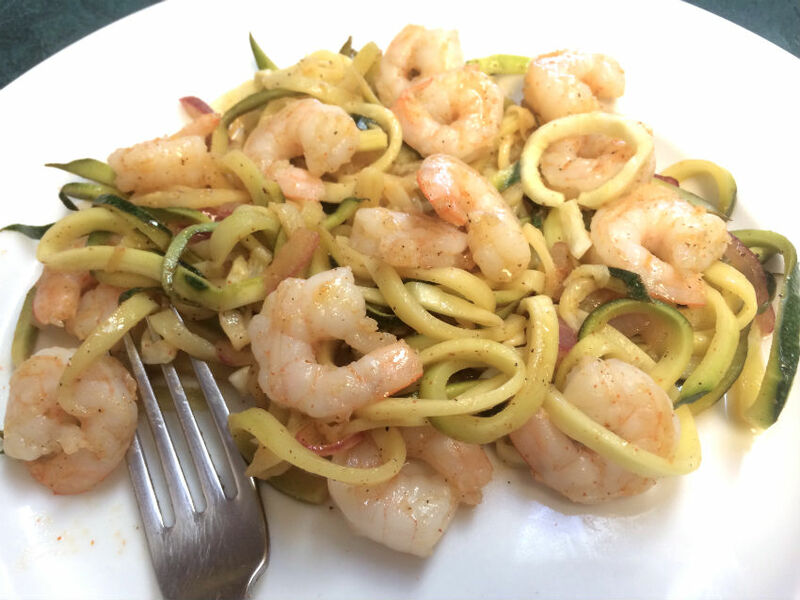 Using zucchini instead of pasta makes for a low calorie, healthier meal. You can use any kinds of squash, but zucchini is remarkably similar to spaghetti noodles, in appearance and in taste. Add to it succulent cajun shrimp and what a taste delight. Lastly, it is a very fast dish to prepare. The shrimp and noodles both cook in just minutes. Give it a try. I bet you will be back for more. Using a ‘spiralizer,’ make the zucchini noodles. If you don’t have a spiralizer, you can slice very thin into ribbons. Blend together 2 tablespoons of the olive oil, ¼ cup lemon juice, 1½ teaspoons creole seasoning, and the pepper. Sprinkle the remaining creole seasoning over the shrimp and coat the shrimp. Heat the remaining tablespoon olive oil in a large skillet. Saute the shrimp for 4 to 6 minutes, until shrimp is pink. Pour the blended mixture of olive oil, lemon juice and creole seasoning into the skillet. Once it is heated, add the zucchini noodles, sauteing for 2 minutes or longer if you prefer softer. Either serve the pasta with shrimp on top, or you can add it to the noodles and toss. I am so pleased with my little Spiralizer. Since I’ve been downsizing, I prefer this smaller version to make zucchini noodles. It works like a charm. You can see my review here, showing photos of how it looks and works. You can do potatoes, for a curly version of hash browns, cucumbers, carrots, even sweet potatoes. It’s easy to use, cleans up beautifully, and is so small it takes up no storage space. I’ve had mine now around two years. It’s still in excellent condition. If you prefer a larger unit with more options, the Paderno vegetable slicer is the best seller. It offers three different blades. One for a ribbon cut, and two for longer noodles, one thin and one thicke. It’s made of BPA free plastic, sturdy and easy to use.